Beautiful collections of furniture sculptures, paintings and precious objects give the Château of Valençay a still inhabited look. 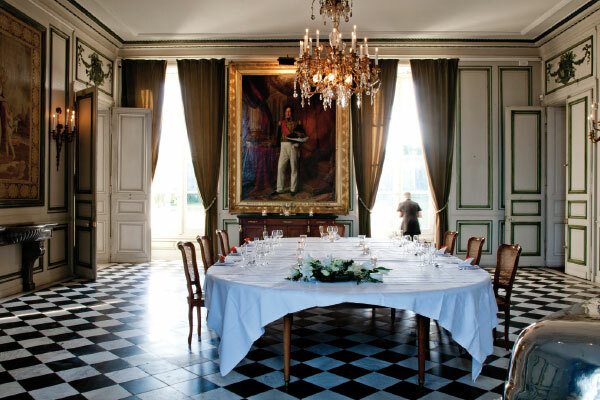 Various coordinating styles contribute to this place’s charm and bear witness to the drastic changes in French government throughout Prince of Talleyrand’s lifetime. The Empire-style furniture is absolutely stunning in the light coming through the large windows with its power, strength and references to the Napoleonic era. 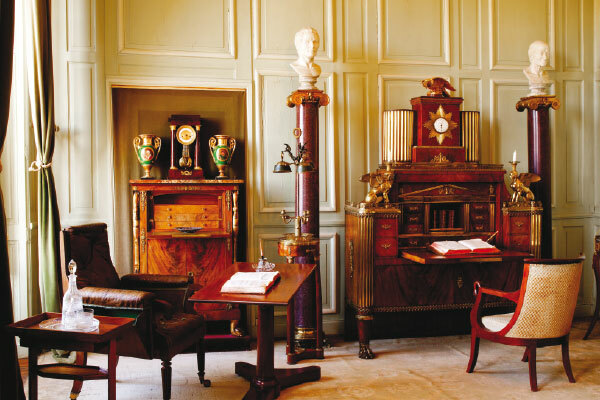 Through its elegance and charm, the 18th century furniture reflects the light-hearted and worldly spirit of aristocratic society that defined the style and etiquette of the great lord that Talleyrand never ceased to be. 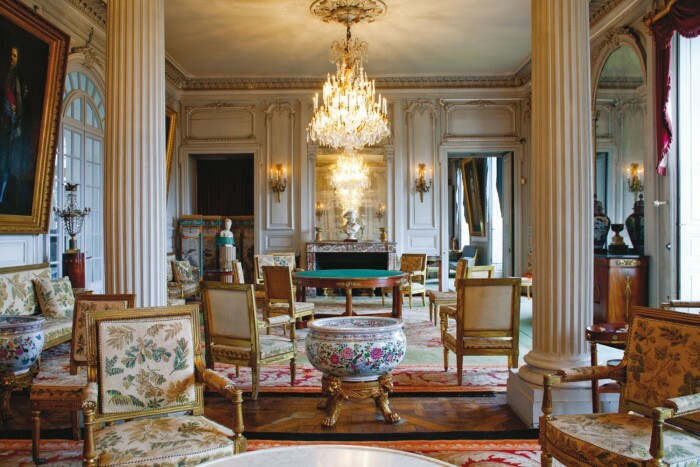 The Louis xv style table was transformed into a card table by the Spanish princes. A big player himself, Talleyrand surely enjoyed it. 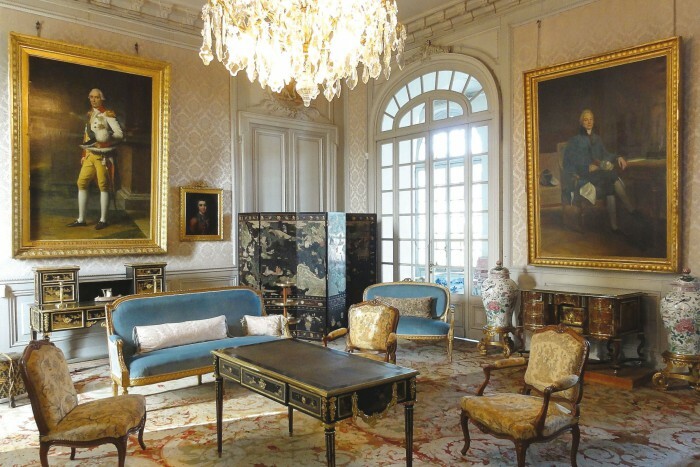 All around: Louis xv and Louis xvi style chairs and small pieces of furniture. A beautiful early 18th century bureau Mazarin, with red tortoiseshell and leather inlay, is attributed to André-Charles Boulle. Porcelain vases from China and Japan, an elegant tiered desk plated with Japanese panels decorated in black and gold lacquer, a six-fold Coromandel screen from China and a pair of round Japanese boxes with black lacquered compartments all reflect the style of the time for objects from the Far East. 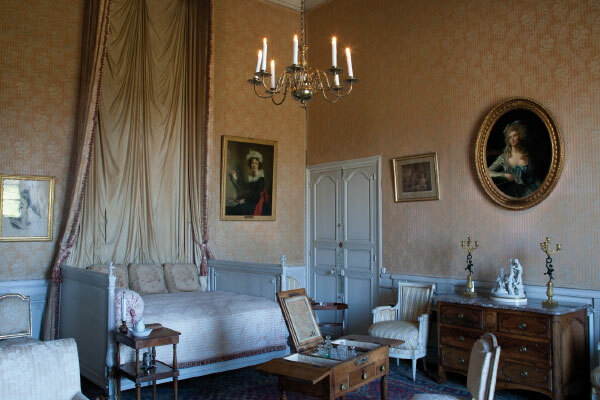 The largest bedchamber in the château including a beautiful set of Empire-style furniture, this room was occupied by the Prince of Asturias from 1808 to 1814. As a prisoner of Napoleon, the future King Ferdinand stayed in a gilded cage thanks to the attention and concern of Talleyrand.A Louis xvi-style bed was specifically made for Ferdinand and small pieces of furniture for gloves, stockings and handkerchiefs all add a touch of sophistication to this room along with the recently added cheval mirror. The walls are covered in a fine panoramic grisaille wallpaper, representing episodes of the life of Cupid and Psyche. The Duchess of Dino, Talleyrand’s beloved niece, gazes upon her former world in a formal dress from her portrait painted by Chabord. This room contains a very fine set of mahogany furniture, including a beautiful Empire Restoration-style sleigh bed made from Cuban mahogany. 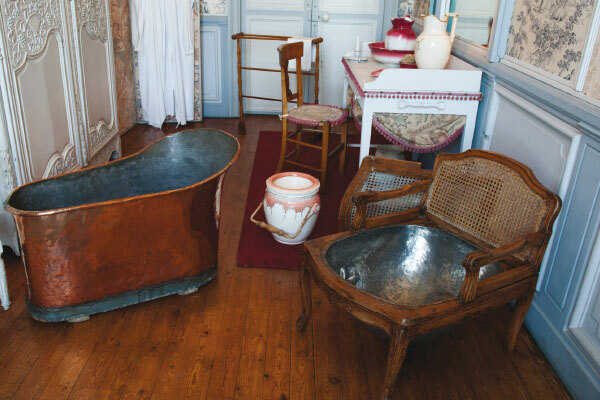 A stunning 19th century copper bathtub and rare Regency bidet-chair are located in the bathroom next to the bedchamber. 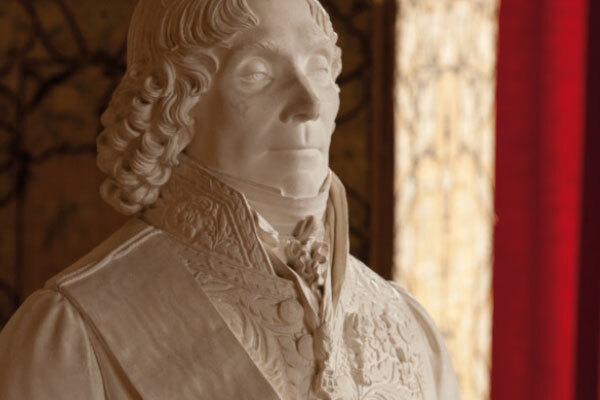 Today, the gallery is adorned with 19th century neoclassic statues and busts, Empire-style chairs and six portraits of Talleyrand’s parents and ancestors. 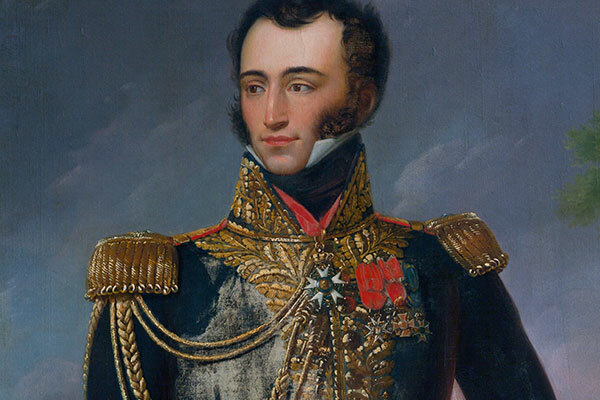 These portraits were painted in 1817 by Joseph Chabord, who was concerned about keeping a prominent derivation belonging to the Counts of Périgord. 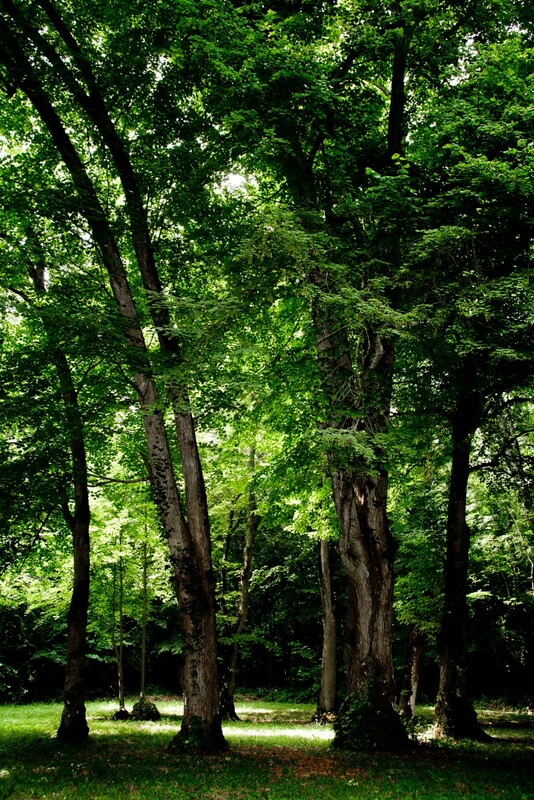 Versailles-style wooden floors, carved woodwork and original painted walls are all inspired by Louis xvi. 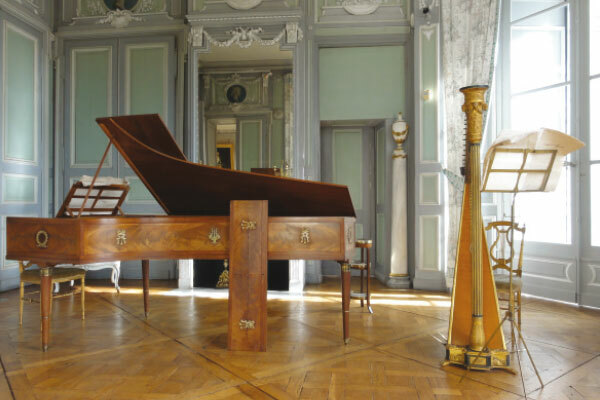 An 1808 fortepiano is featured, made by the famous Erard piano factory and signed by the Czech composer Jan Ladislav Dussek. 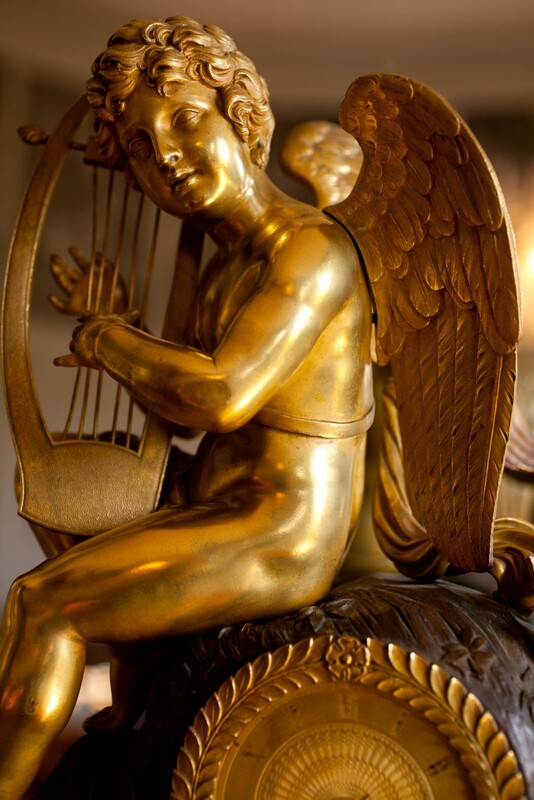 The wooden green and gold harp from 1818 was made by François-Joseph de Frey. The dining room displays a magnificent mahogany table seating up to 36 guests, refreshment console tables made of marble, a cutting table and an elegant decor. On the walls are two beautiful Empire Beauvais tapestries, a fine counterpart with their antique motifs to the work of Canova: a statue of Hebe, the Greek goddess of youth. This room was named after the Empire-style bed that belonged to this famous female scholar. Here you will find a small striking pedestal table engraved with hieroglyphics with its three legs embellished with lion heads and paws. It was originally designed to be placed outside an Egyptian temple, and considered a creative structure made for a gardens and parks. 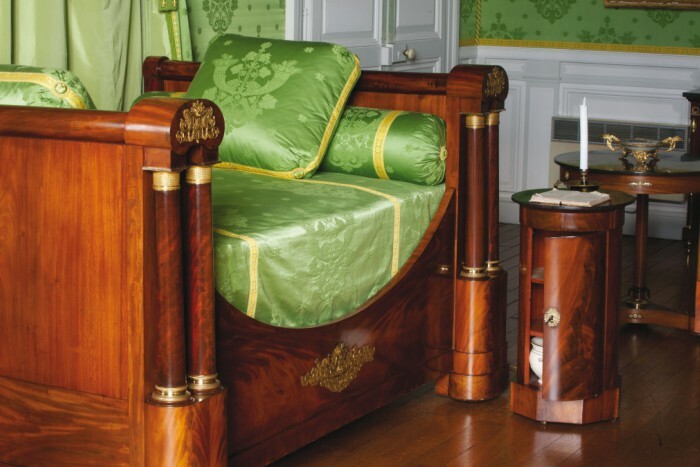 Some of the beautiful Empire-style furniture comes from the Hôtel Saint Florentin in Paris, where Talleyrand died in 1838. The mahogany bed with an Egyptian-style headboard, Egyptian Revival chest of drawers with marble top and claw feet, small pedestal table with two marble surfaces, three rounded claw legs with hawk heads and gilded bronze motifs. 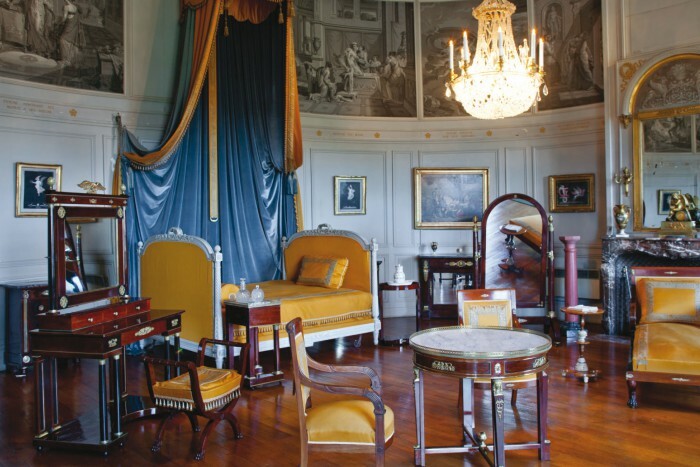 This room holds various pieces of office furniture that belonged to Talleyrand. The large early 19th century writing desk was supposedly a gift from Prince Murat, King of Naples. It contains several secret drawers and hiding places. The mahogany veneer table and leather armchair with bellow pockets were used during Talleyrand’s last diplomatic mission, in London from 1830 to 1834, for King Louis-Philippe. 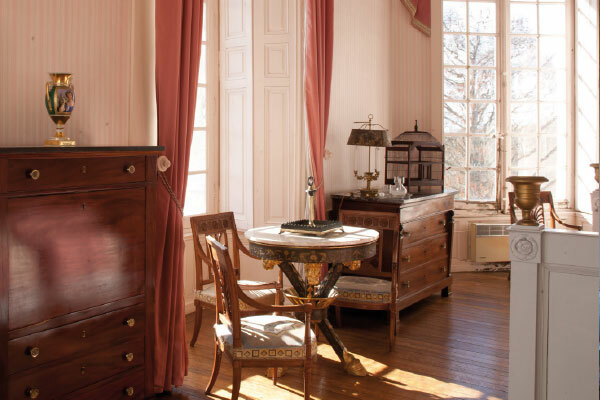 With its Toile de Jouy wall coverings, it separated the two bedrooms and was previously an antechamber. People generally washed in small rooms next to the alcoves. A few 18th and 19th century bathroom fittings have been collected here. It serves all of the upstairs apartments and ends in a small room, formerly used as a chapel, which holds today a copy of Houdon’s “Diana the Huntress”. 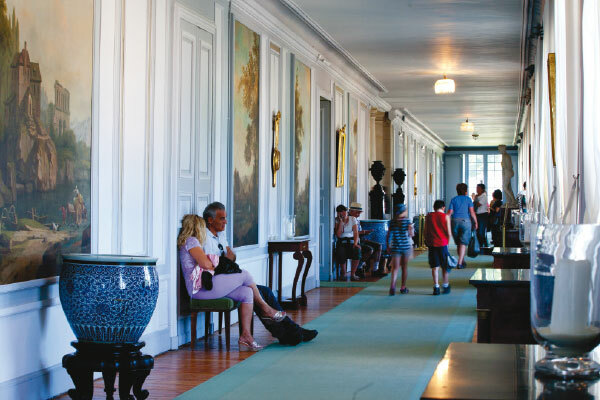 This corridor is filled with many Empire and Restoration-style chests of drawers and console tables. 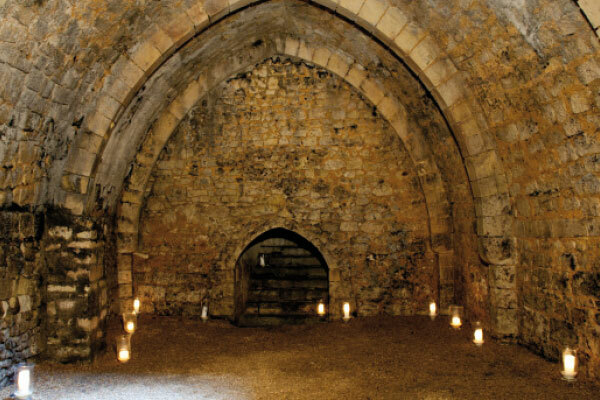 Equipped with ovens and copper utensils were comfortably set up in the 17th and 18th century basements. Antonin Carême worked wonders here and everywhere else Talleyrand’s career took him for 12 years. This room, located on the first floor of the keep, still bears witness to the style and taste of upper class people at the time of the Renaissance. 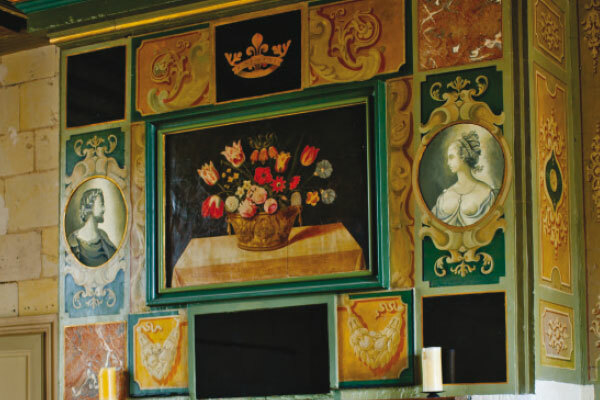 Under a beautiful painted French-style ceiling, an impressive fireplace presents a superb basket of flowers in the centre of its hood surrounded by the weapons, monograms and portraits of Louis d’Estampes and his wife, Marie. to a room located underneath the Cour d’Honneur (Grand Courtyard). It is the last remaining part of a fortified castle built in the 13th century. 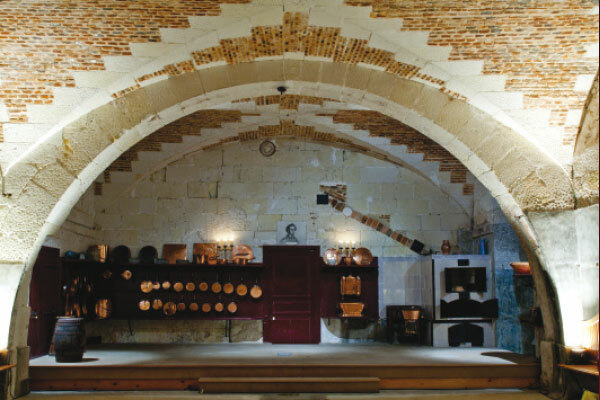 Divided into three bays by thick arches, its point barrel vault covers an area of 49.5 square metres.